Celebrated for continued innovation and value, BRP Sea-Doo dominates the industry in National Marine Manufacturer Association (NMMA) Awards by winning five awards in the past four years. This legacy of awards has fostered BRP’s leadership in developing the next generation of personal watercraft. This week marks the biggest show in the marine industry, the Miami International Boat Show, the largest of its kind in the world. One of the show highlights is the NMMA Innovation Awards that acknowledge manufacturers who bring to market new and innovative products that advance the boating industry and honor them for integrating new concepts that provide practicality to the consumer in a cost effective manner. Winners are selected by a panel of judges consisting of members of Boating Writers International and the awards are announced each year at the show on South Beach. BRP Sea-Doo has led the PWC, Jet Boats and Pontoon category as well as an award in the Water Sports and Equipment category. “BRP’s Sea-Doo Ergolock seat, angled footwells, and T3 hull combine to create a PWC with incredible turning ability and maximum comfort designed to build confidence in its rider. It made me an instant expert,” said NMMA Innovation Award judge Alan Jones. The Sea-Doo RXP-X 260 watercraft redefined the musclecraft segment with an ominous visual appeal from its flowing facet design, ram air intakes, large side grills and distinctive new Ergolock system and tight-turning T3 hull. BRP’s Ergolock system includes angled footwell wedges and a gradually narrowing seat design to help better connect the rider to the watercraft. It reduces upper body fatigue by allowing the rider to ride faster, for longer periods of time. BRP’s Ergolock system complements the tight turning aspect of the T3 hull that features an innovative dual surface design that responds differently at high or low speeds. The new T3 hull shape combines soft and hard chines and adjustable sponsons with winglets and trim tabs that allow the watercraft to lean into corners, better maintaining entry and exit speeds after turns. In 2011, BRP’s Sea-Doo GTI SE 130 watercraft was completely redesigned with an intense focus on improving rider ergonomics and comfort while integrating the exclusive iBR system. BRP’s iBR provides riders with a level of control never before experienced on the water with simplified maneuverability and the peace of mind knowing that riders can stop when wanted. The Sea-Doo GTI SE 130 model is also equipped with intelligent Throttle Control (iTC) that allows the rider to electronically control how power is delivered through various modes including ECO mode†. “Winning two NMMA Innovation awards in the same year is a tribute to BRP’s commitment to innovation and to moving the marine industry forward,” said Yves Leduc, vice president – general manager, North America division after accepting the awards. BRP’s 2010 Sea-Doo RXT-X 260 watercraft has many of the innovative iControl technologies including BRP’s exclusive iBR (intelligent Brake & Reverse) system. BRP’s iBR provides riders with a level of control never experienced on the water with simplified maneuverability and the peace of mind knowing that riders can stop when wanted. With upgraded, race-inspired steering, with A.E.S. (Adjustable Ergonomic Steering) and customizable power delivery with an electronically adjustable ignition system, the Sea-Doo RXT-X 260 offers enthusiasts the most advanced high-performance PWC in the industry. BRP’s Advanced TEC iCatch PWC trailer simplifies the launch and load process. The torsion axle design of the trailer lowers the cradle point of the PWC providing better highway handling and ability to launch and load the PWC in shallower water. 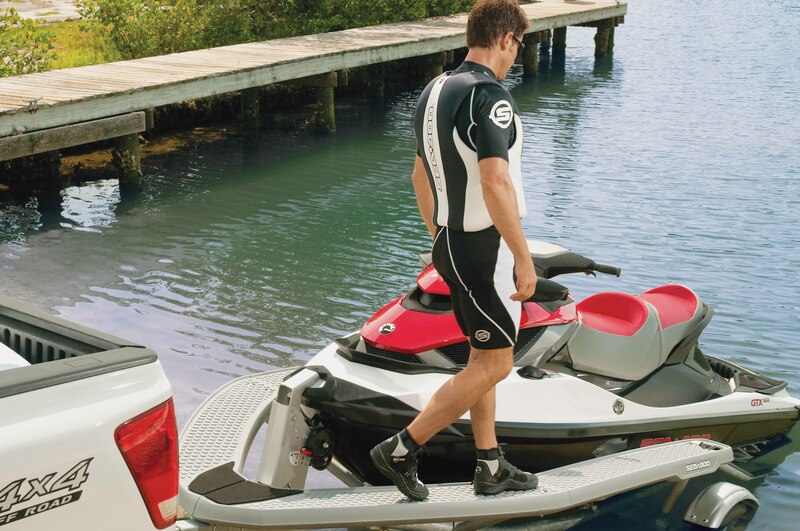 The wrap around walk pad allows riders to mount and dismount the PWC clear of slippery launch ramps and further simplifying the launch/load procedure is the iCatch release lever, located on the walk pad that can be pulled while seated aboard the PWC. The roller bunk design centers the PWC when loading and the iCatch system automatically hooks the bow securing the PWC on the trailer. BRP’s Sea-Doo GTX Limited iS watercraft was the most advanced recreational vessel launched in decades, featuring many new technologies that dramatically improve the on-water experience for the operator. In addition to the first on-water braking system and full rider suspension, the Sea-Doo GTX Limited iS features the S3 hull, the first high-performance stepped hull design in the industry. BRP Sea-Doo maintains its legacy of innovation, high performance and design by continuing to manufacture these models with additional technology and design elements each year. Stop by the Sea-Doo booth at the Miami International Boat Show to view the 2013 models. * check with your local dealer for current model pricing.